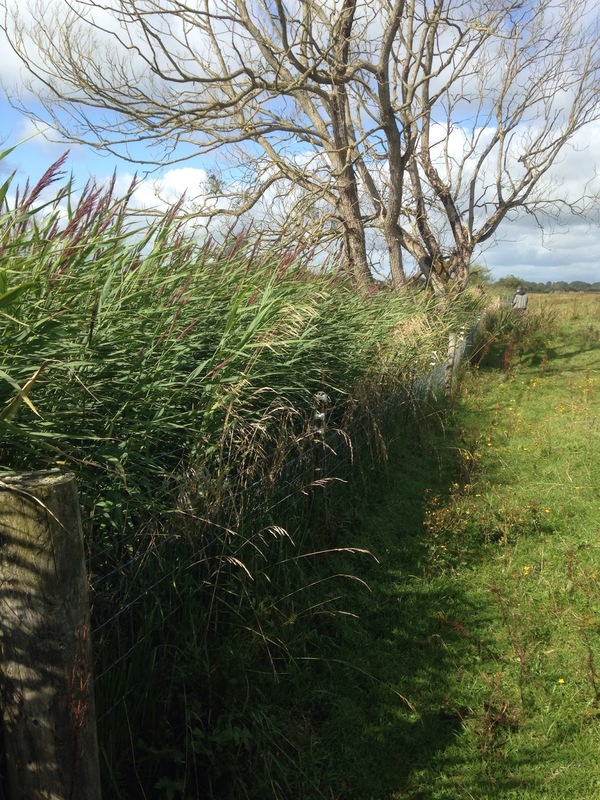 During Heritage week Kathryn and I went back to Inishee Island to finish up work on the fence for the year. We rounded up a great group of volunteers who all worked so hard to get the work done in two days. 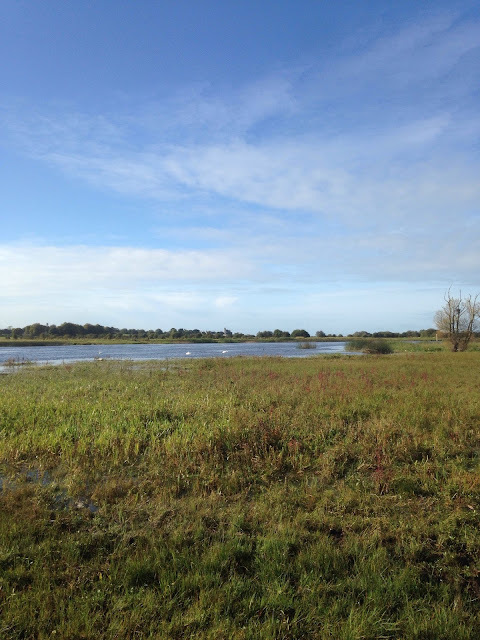 All the birds were gone and it was very quiet – a big change from earlier on in the summer when all you could hear were the calls of breeding Lapwing, Redshank and Curlew and the chipping and drumming of breeding Snipe! 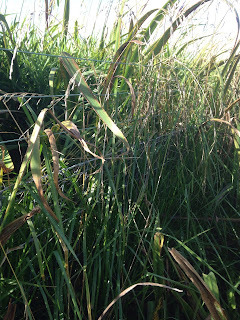 It was incredible to see how much the vegetation had grown back along the fence! You wouldn’t have known myself and John had spent days trampling it down and cutting it back a couple of weeks earlier! The first job we had to do was to open the gaps in the fence. It was nice to see the operation of the fence the whole way through as I had been there when we closed the gaps back in May. 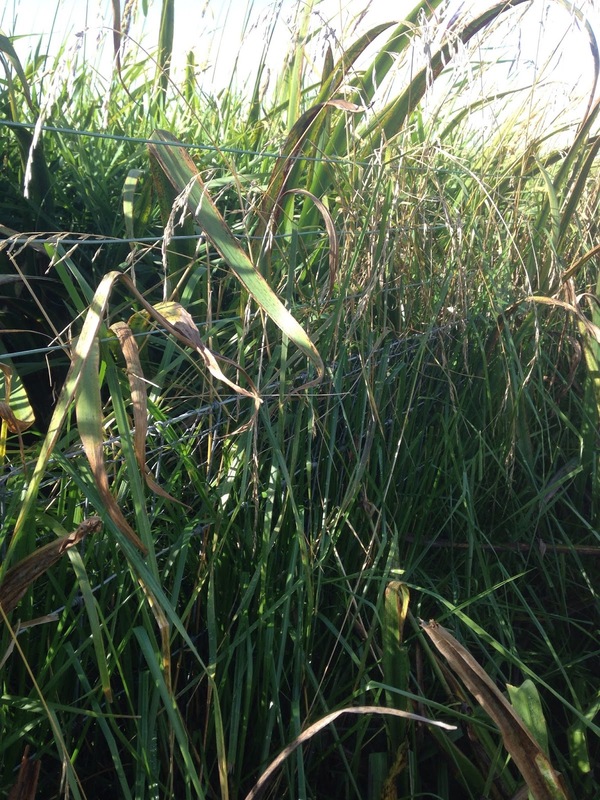 The gaps are opened to allow the cattle access to the area outside of the fence for grazing. This stops the river margins from becoming rank, which can be a deterrent to breeding waders, and also gives the farmer back valuable grazing area. While half of the volunteers got to work opening the gaps the rest of us commenced work tackling the overgrown vegetation. We had our work cut out trampling it down and cutting it back with hedge clippers. 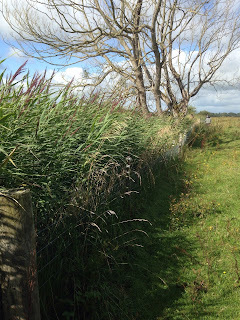 In some places the reeds were growing well above our heads and it was strenuous work! Every time we go to the island we bring a voltage checker to check the current that runs along the electric fence. I saw just how important it is to keep on top of the vegetation because when it touches off the electric wire it drains the current. With the gaps opened, the vegetation controlled and electric fence running smoothly, it was time to leave the island for the last time. 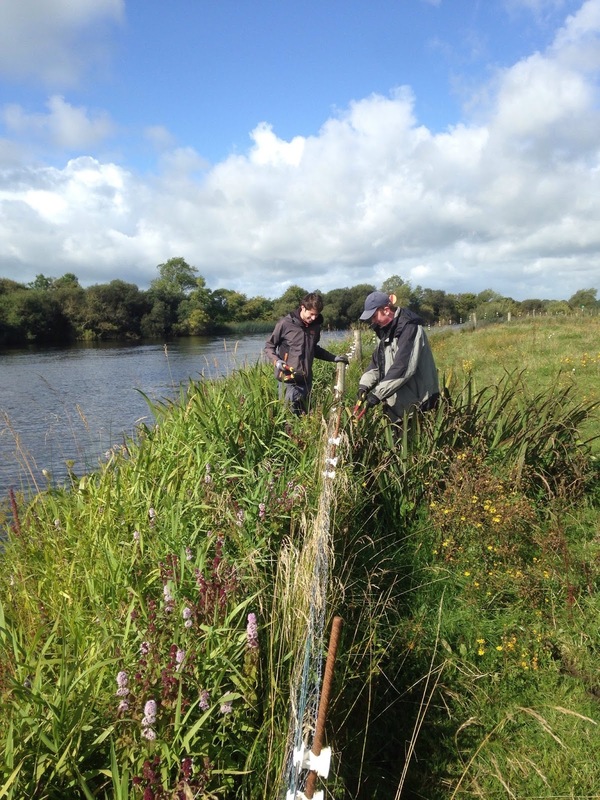 It feels good knowing that the work we did on the fence will make a real difference protecting breeding waders on Inishee Island next year and hopefully for many years to come! 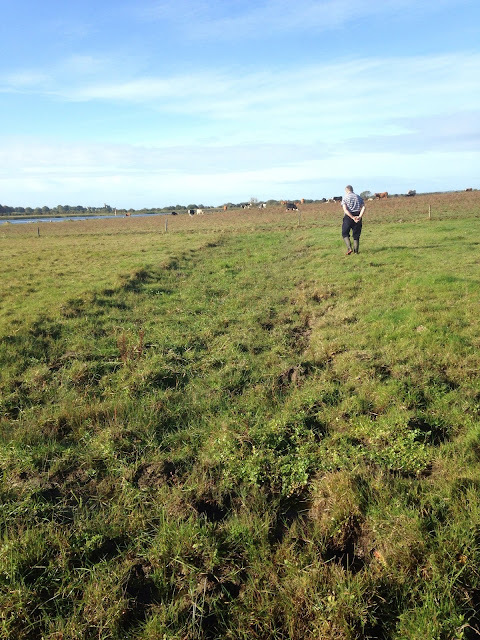 Kathryn and I have also been getting out to some of the other management sites along the Callows where we have seen flocks of post breeding Lapwing and the odd solitary Snipe. 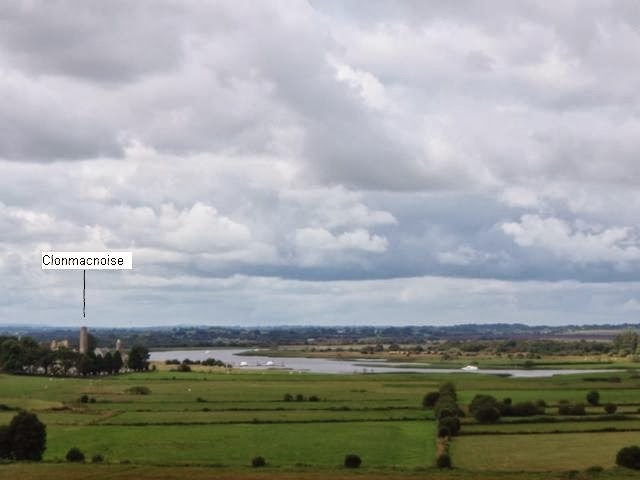 There is definitely something special about the farmland of the Shannon Callows… especially knowing that it is one of the last strongholds for our rare breeding waders! 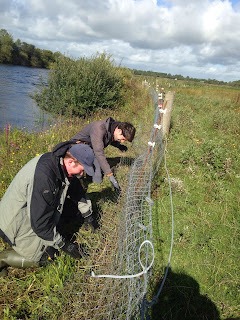 This year I was lucky enough to start as an intern with BirdWatch Ireland. 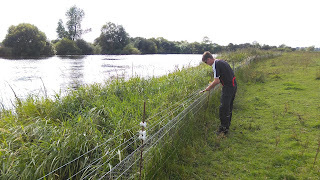 One of my first tasks was to help get the predator proof fence on Inishee up and running. I’d heard a lot about this fence and its success, so was really excited to get an opportunity to work on it. There was a very late spring flood this year which meant that work on the fence was delayed. We couldn’t begin until the flood dropped which wasn’t until the first week of May. We had a great bunch of enthusiastic volunteers this year. Everyone worked really well together and were in high spirits despite the horrible working weather! The late start on the fence meant that we were lucky enough to see some of Ireland’s rarest breeding birds up close. It was great becoming familiar with their distinctive calls and a real highlight was getting to see Lapwing and Redshank nests and chicks. I was amazed at how well camouflaged Lapwing chicks are and how still they keep in order to avoid being detected by predators. Great care had to be taken when walking around the island to avoid stepping on one! We had been working for only a few days when the torrential rain started to fall causing the river to flood once more. The river level rose so fast! One morning we arrived on the island and I was shocked to see that part of the fence that we had been working on the afternoon before was now completely submerged in water. The rising flood meant that we had to abandon work by the end of the week, leaving some of the gaps open. Once the flooding receded myself and another volunteer went back to finish the little bit of work left and finally the birds were protected. A couple of weeks later the pair of us were back on the island carrying out vegetation control. The spell of warm weather made the work enjoyable and we were lucky to see more Lapwing chicks and fledglings. We were also delighted to see two pairs of breeding Curlew and a couple of drumming Snipe. Unfortunately, flooding meant that normal breeding wader population and productivity monitoring in the Callows was not carried out this year. Many birds were displaced by the flood causing them to give up on breeding. This would have made the results incomparable to previous years and wouldn’t have given us any indication as to how the population is faring. 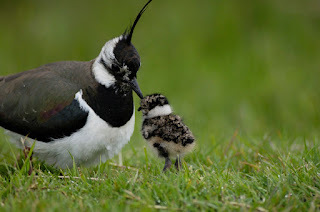 However, we did keep an eye on Inishee as much as possible and we know that thirteen pairs of Lapwing successfully hatched chicks and we know that three fledged chicks. 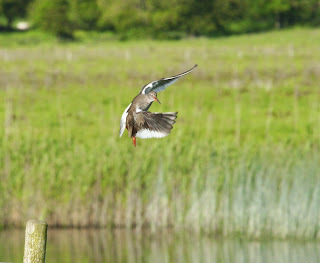 We also know that there were four pairs of Redshank, two pairs of Snipe and two pairs of Curlew with chicks. This is a great result given the year that was in it. We will be back on the island next week to open the gaps and carry out some more vegetation control. Thanks to all the volunteers who have helped out this summer and to those who are going to help out next week. Hopefully we will have some good weather! Over the summer we visited the other sites and I have to say the farmland in the Callows is really lovely. 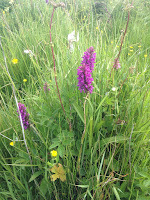 I was very impressed to see such a rich floral diversity in the meadows. 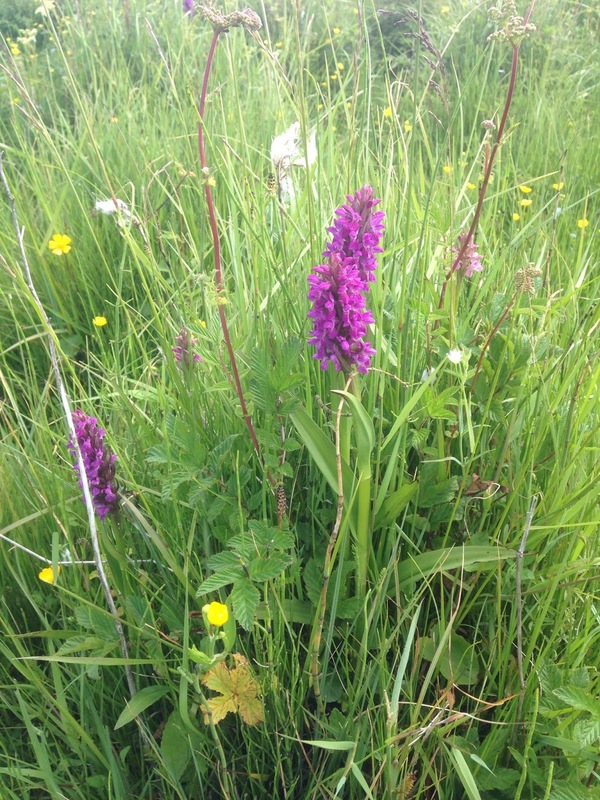 Coming across beautiful orchids was a real highlight! On a late June visit to Inchinalee (where the new predator fence has been erected) we saw two pairs of Lapwing, one of which had successfully fledged a chick, and seven pairs of Redshank. We were surprised to also find a Lapwing nest so late in the season. This year for the first time ever there were no Corncrake heard in the Callows. This devastating news has really saddened the locals, farmers and all of us here at BirdWatch Ireland. 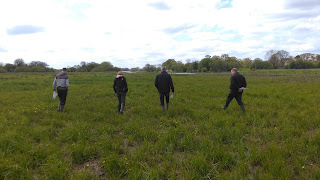 Working with BirdWatch Ireland in Banagher has been a fantastic experience and what was particularly nice was getting to meet the farmers involved in the Breeding Wader Grant Scheme. Really lovely people who without a doubt care about the survival of our rare breeding waders. Hopefully next year will bring more favorable weather for breeding waders! The first couple of months of 2014 have been challenging for water birds and waders in Ireland. High winds and storms put great pressure especially on migrating species as it means they have to spend more time, under difficult conditions, searching for food. There have been several reports of sea birds being washed ashore along the western seaboard and on the south east coast, probably as a result of exhaustion and lack of food. These storms in mid and late winter can also result in winter vagrants turning up on our shores. Species that are on passage migration to their intended winter grounds can get blown off course and turn up on our shores or further inland. One such example was the Glossy Ibis that was spotted feeding next to the River Shannon some weeks ago. BirdWatch Ireland received a call from a local resident to say that there was a ‘black curlew’ feeding in their garden. On visiting the site, just on the edge of Shannonbridge, sure enough the caller was correct. The Glossy Ibis or ‘Black Curlew’ as it is sometimes called was busy feeding in a water logged back garden alongside some black headed gulls. 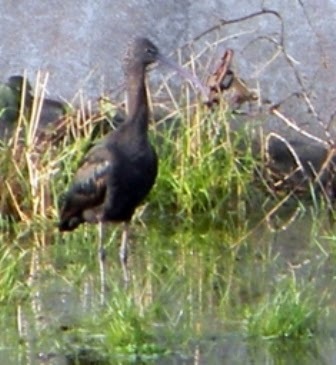 Glossy Ibis are a medium size, long legged, wading bird. They have a long downward curving bill similar to a Curlew and the winter birds that arrive here have a brown black appearance to their plumage with a slight green and purple gloss to the upper parts. On migration some birds, particularly juveniles, can become separated from adults flocks and begin dispersing in all directions, which could account for this record. The last one known to be recorded in this area was in Banagher in 1909. Elsewhere on the callows, the numbers of winter migrants have been reaching the peak numbers over the last month with thousands of Golden Plover, Lapwing and Wigeon recorded along the River Little Brosna callows with sizable flocks of Pintail, Teal, Tufted duck and smaller numbers of Pochard, Whooper swan and Greenland White-fronted Goose. By April many of the winter migrants will be leaving to return to their summer grounds, by which time we will be looking forward to the arrival of our breeding waders on the Shannon Callows. 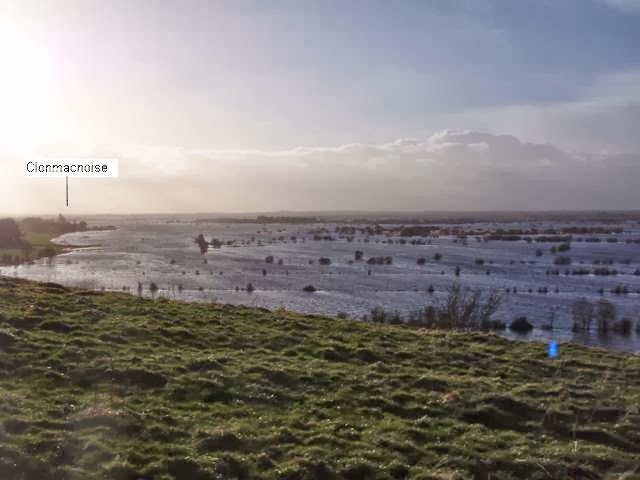 The flood remains high at the moment with Inishee Island and most of the breeding sites remaining underwater. Hopefully this fine spell will continue over the next couple of weeks and expose some of the badly needed habitat that is crucial for prospecting breeding waders. Well, it’s almost Christmas eve and we’re getting into the heart of winter but water levels on the River Shannon have been unusually low up until this weekend. Some fields were flooded just over a month ago but the river receded again and dropped to almost summer levels before rising again following the recent stormy weather. Usually the flocks of winter birds are pushed up into these fields by the flood and can be easily seen at this time of year. But as the river has been low the birds were absent from the spots where large flocks can be usually spotted. However, Bullock Island commonage, close to Shannon Harbour and the Little Brosna are still excellent spots for doing some bird watching over the Christmas. Between the two you have a good chance of encountering large flocks of Lapwing, Golden Plover, Curlew, Wigeon and Teal as well as Pintail, Shoveler and Tufted duck among others. Large flocks of Golden Plover are not unusual in this area and watching them feed on the callows it’s hard to believe that this medium sized wader is somewhat responsible for all those records that have been broken since the start of the Guinness book of records. The story goes (recorded in the 31st edition of the book) that a hunting party had spent a day shooting on the Wexford Slob lands during which time they had missed some Golden Plovers in a flock. That evening there was a lively discussion about whether or not the Golden Plover was Europe’s fastest game bird. Some argued that it was the Red Grouse but it was Sir Hugh Beaver, then managing director of the Guinness breweries, that realised there was no book that could answer the question one way or another and that there must be many other similar questions that went unanswered. The first record book was published in August 1955 and by Christmas it had reached number 1 on the best sellers list. Oddly enough it wasn't until the 39th edition in 1989, that the Red Grouse was claimed by the Guinness book of records to be faster than the Golden Plover. In the new year the breeding wader project starts to prepare for the coming breeding season and part of this includes the annual maintenance of the predator proof fence on Inishee. 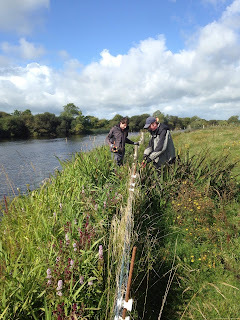 As you may have seen earlier this year we rely heavily on volunteers to help out with this important task, so if you think you might be interested in helping out next year go to http://www.birdwatchireland.ie/Jobs/tabid/71/Default.aspx for more details. I’d like to thank all of you who visited the site this year and to wish all of you a very Happy Christmas and prosperous 2014. I look forward to keeping you all up to date on the project over the next breeding season. The breeding season has come to a close for yet another year and thankfully it has been a successful season for breeding waders on the Shannon Callows. While the weather has been reasonably mild, winter continues to creep in and many of the migrant species that will feed on the callows over the coming months have now arrived. 2013 has seen a continued increase in total breeding wader numbers on the sites managed as part of the Breeding Wader Project. The final numbers were 16 pairs of Lapwing, up 8 on last year; 105 pairs of Redshank, up 26 on 2012; 22 pairs of Snipe, down 2 on last year and no change for Curlew with just 1 breeding pair recorded. The Curlew successfully fledged two young, and continued to remain around Inishee into late August when most of the other breeding waders had left. 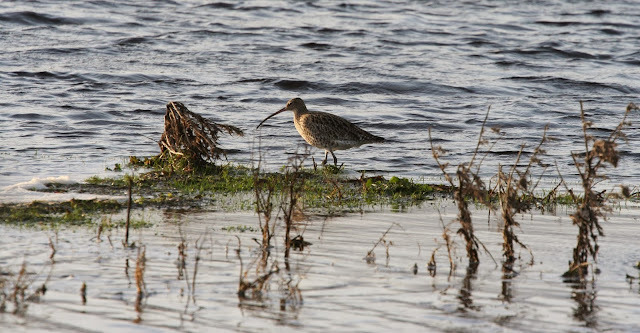 The Shannon Callows remains one of the few lowland areas where breeding Curlew are recorded in Ireland. In 2007 Curlew was added to the IUCN red list of threatened species. It is estimated that there are now less than 200 breeding pairs left in the country – a 96% decline in 20 years. As well as areas like the Shannon Callows, Curlew like to breed in marginal upland areas and it is likely that afforestation, commercial peat cutting and wind farm developments have all led to their breeding range becoming more fragmented. The Halting Environmental Loss (HELP) project is a cross border initiative between RSPB Northern Ireland, RSPB South West Scotland and BirdWatch Ireland, who are focusing on the conservation of breeding curlew in the border counties of Ireland through survey and management work. Let’s hope that through these widespread efforts we will continue to hear the very evocative cry of the curlew on our wetlands and uplands for many years to come. Meanwhile, the winter waders have well and truly arrived. Over the past few weeks the area has seen an increase in the number of winter migrants coming in. Our small numbers of resident breeding waders are suddenly replaced by larger winter flocks that come to avail of the abundance of food on the wet grasslands at this time of year. Black-tailed Godwit, Lapwing, Teal, Golden Plover and Wigeon all occur in large flocks and are joined by other species such as Dunlin, Shovler, Pintail, Whooper Swan and Black Headed Gull. Who would have predicted in summer 2012 that we would be experiencing the kind of temperatures we are all enjoying at the moment. In June of last year juvenile Redshank were swimming in floodwaters and the Shannon was at winter flood levels; threatening the productivity of breeding waders. This year the water levels are low, the birds are dry and thankfully have had a successful breeding season. On Inishee we are keeping the chick feeding areas wet during this hot spell, by pumping water from the river onto the island to ensure that chicks can feed easily and safely within the boundaries of the predator proof fence. Ray tends to the water pump on Inishee. Over the past couple of months our volunteers were also very busy keeping the tall vegetation down and preventing it from touching the electric wires on the fence, ensuring the maximum current was delivered. A big thank you once again to Ray and Ciaran who gave up their time to help with these important tasks. Things have quietened down considerably in the past couple of weeks as Lapwing and Redshank chicks have fledged and they start to leave the area again. The Snipe continue to Chip and Drum as their breeding season continues and a single Curlew remains on Inishee, their chicks not having fledged yet. 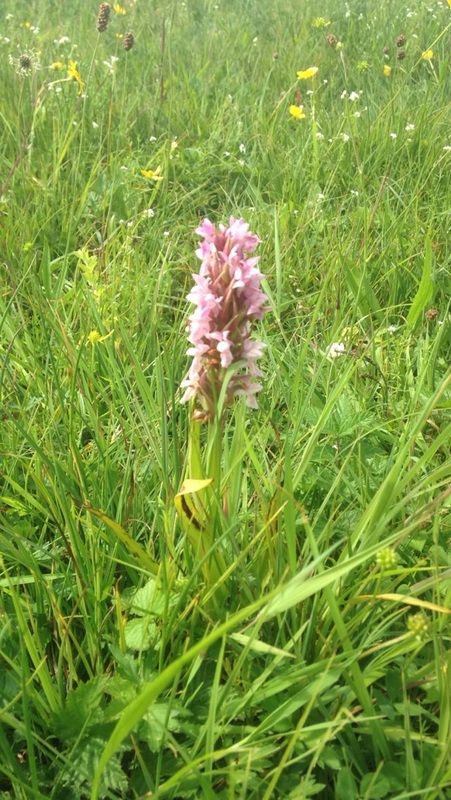 This is fantastic considering Curlew were absent from the island last year. On sites under the management of the Breeding Wader Project, funded by National Parks & Wildlife Service, and operated by BirdWatch Ireland, the total numbers of Redshank and Lapwing have increased on last year. Although still at critically low numbers, Lapwing populations have doubled from 8 pairs in 2012 to 16 in 2013 while the numbers of Redshank have increased from 79 pairs to 104. Outside of Inishee, the greatest increase was recorded on Bunthulla, up near Clonmacnoise; 31 pairs of Redshank compared to last years 11. As Snipe haven’t finished breeding yet, we will have a better idea of overall figures when their breeding season comes to a close in late July. Tall vegetation is kept clear of the electric wires. Kathryn is now off on maternity leave and I (Colin Gallagher) will be covering for her in her absence. I look forward to continuing to keep you updated with the sounds and sights of the Shannon Callows over the coming months.